BRITAIN: Commons Speaker Deals Brexit Blow To PM - Joe.My.God. 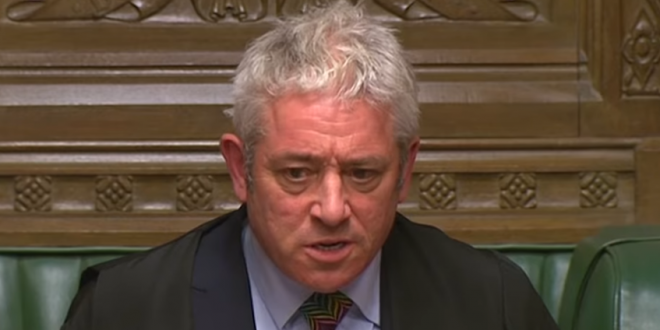 The House of Commons Speaker, John Bercow, has said the government cannot bring the meaningful vote back to parliament again unless there has been substantial change to the Brexit deal. In a shock move likely to infuriate the prime minister, the Speaker said the House of Commons was “being repeatedly asked to pronounce” on the same question. Bercow suggested he believed such a fundamental change would involve a renegotiation at EU level, rather than clarification of the legal advice written by the attorney general, something that had been suggested this week. Downing Street was blindsided by the announcement and unable to give a response at its regular afternoon briefing for journalists. “The speaker did not forewarn us of the content of his statement or the fact that he was making one,” May’s spokeswoman said.